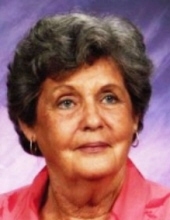 PAXVILLE – Suzanne Matthews Funderburke, 87, widow of Eugene Carson Funderburke, Sr., died Saturday, April 13, 2019, at Covenant Place. Born June 4, 1931, in Paxville, she was a daughter of the late William Charles Matthews and the late Amelia Curtis Matthews. She was a member of Paxville United Methodist Church. She is survived by three daughters, Sandy Richardson (Phillip) of Sumter, Denise Rowland (Earle) of Paxville and Melissa McLachlan (Colin) of Sumter; a daughter-in-law, Carolyn Funderburke of Conway; eight grandchildren; eleven great grandchildren; four nephews; and a niece. In addition to her husband and parents, she was preceded in death by a son, Bucky Funderburke; a great grandson, Kevin Cribb, Jr.; a sister, Sarah Mae Keith; and a niece, Donna Kay Sullivan. A graveside service will be held at 11 a.m. on Wednesday, April 17, 2019, at the Paxville Cemetery with the Rev. Eugene Mosier and the Rev. Mary Everhart officiating. The family will receive friends immediately following the graveside service. The family would like to thank nurses and caregivers of Embrace Hospice, Kathy Murdock, Shirley McBride, Adrienne Robinson, Pam Weinberg and Cindy Bolen, nurses and caregivers of Covenant Place, and special caregivers, Bertha Briggs, Ora Nelson, Iesha Tindal and Loretta Bosier for all of their loving care and attention. Memorials may be made to Paxville United Methodist Church, c/o Harold Corbett, 1130 McLeod Road, Manning, SC 29102, or to Epworth Children’s Home, 2900 Millwood Avenue, Columbia, SC 29205, or to a charity of one’s choice. To send flowers or a remembrance gift to the family of Suzanne M. Funderburke, please visit our Tribute Store. A charity of one's choice. "Email Address" would like to share the life celebration of Suzanne M. Funderburke. Click on the "link" to go to share a favorite memory or leave a condolence message for the family.